For several years now, I have received scores of emails that have asked me for advice on certain situations. 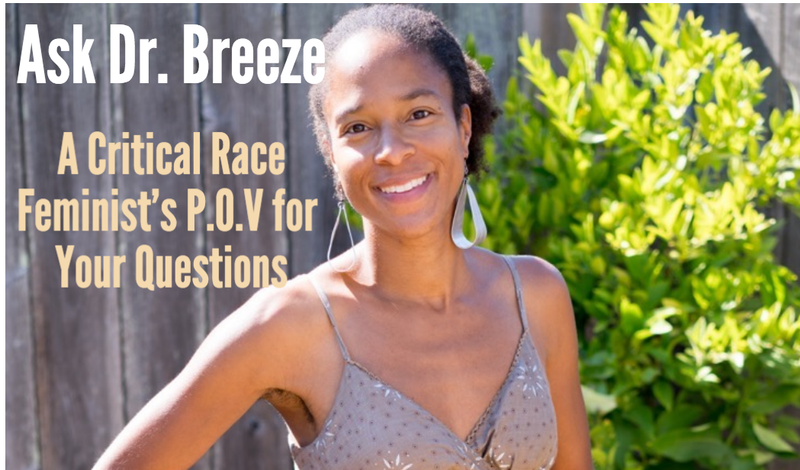 As of yesterday, I decided to create a Ask Dr. Breeze section of my Sistah Vegan Blog. Simply send me your questions and Post them to the blog and try to offer a response. The most important thing to remember is that these responses are my take on the situation; it is not the end all be all and simply 1 perspective out of billions. What I can provide is a critical race feminist framework + my own embodied experiences + engaged mindfulness (Ahimsa and Zen Buddhist based) when offering my wisdom. Here is the first email to kick off the series. At the end, I offered my two cents but also wanted to open it up to others out there who would like to compassionately weigh in. I definitely will not be publishing comments that are cruel and troll-like. Note: the person who wrote the email below is a Black identified woman. On another note, I would like to kindly ask your opinion/input on a situation. I just started attending a therapeutic group that is using “The Artist’s Way” book by Julia Cameron for a ten weeks. Hence, the center should foster a safe space for healing as they are a counseling center. When I attended my first session this past Wednesday, a man came in late and he had a prominent confederate flag patch on his leather vest. When I saw that, I was immediately uncomfortable. What is alarming is that both facilitators never said a word, and one of the facilitators is a black woman. I wanted to bring this up to the group but felt maybe I should wait since it is the first session and just let the facilitators know. Also, I didn’t want to create an environment (for me) where the other people in the group who are all white may try to tell me that I am wrong for feeling the way I do as he is not a racist, etc. So, I let the two women facilitators know how uncomfortable I was and that he consciously wore this flag to the center with intent. One of the facilitators asked if I wanted to bring this up to the group which I said I didn’t have a problem doing; I stated I don’t feel I should have to educate people on what the flag represents and symbolizes as it should be evident especially with all the media attention and recent [Charleston] tragedy . Additionally, I said I should not have to defend myself against this as again, it is evident. However, this is more about impact than intent. Requesting that you enter that space with him will be a space saturated with the socio-historical dynamic of systemic racism and white supremacy by default. Whether he is conscious of it or not, he would be white-mansplaining the meaning of the flag for him and the impact on your would be negative. If he ‘understands’, it is strange he needs to explain versus simply apologizing for the unintended impact. Many [white] people who display the confederate flag really do believe, “It’s not about racism but just the deep meaning it has to my Southern roots and pride.” Images like the below, sprung up quite a bit, post-Charleston. He may sincerely feel bad that he wearing it caused you to feel unsafe and perhaps it’s important for him to clarify that he is not a Dylann Roof. He may not have been malicious at all (you stated you experienced it that way), but once again, it doesn’t matter about intent, as one can have good intentions and still have bad impact– especially if they are coming from a place of ignorance and privilege(we all have done that). However, it’s up to you on whether or not you want to enter that space to listen to him. I have personally felt it to be painful and heart-breaking to hear those in privileged social locations explain their beliefs that have negative impact on those not part of that privileged social location. I’ve heard white people explain to me why something is not racist, despite the social science and legal studies research showing the negative impact that ‘something not racist’ has had on non-white groups. I have had cisgender men explain to me why something isn’t misogynistic, despite the rigorous research showing otherwise, in terms of impact. At the end of these dialogues monologues, I have never felt like that person was being an ally or dismantling the very systems of oppression they were benefiting from; just being apologists. I’d imagine that most mainstream healing and trauma places in the USA are not trained to handle these situations, unless they really are targeting a certain population (i.e. healing and transformation spaces for Black queer women for example). Most staff don’t have experience in [un]conscious bias training and facilitation around the Big 8 or 9 social identities/processes that comes out of systemic oppressions (i.e, race, class, gender, ability, etc). It could very well be that the interns knew the symbol was problematic but simply didn’t know how to handle it. May you find the right healing space for yourself. Want to to send your questions in for the Ask Dr. Breeze series? Go here to submit your questions and we’ll post it anonymously! Speaking from a privileged social location: thank you! 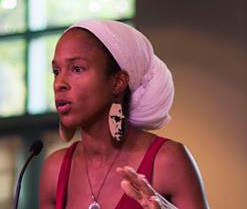 I’m responding from the perspective of a retired psychotherapist with many years of clinical practice experience and the situation M described filed me with dismay and anger at the failure of the agency (and the professionals) to fulfill their duties and responsibilities. .
To me that statement would encompass instances where someone is displaying racist or terror symbols like the confederate flag. M has no obligation to “explain” racism and/or racist symbols to anyone…that’s the responsibility of the professionals there to be competent at understanding racism and at recognizing racist symbols. Given the tenor of the reply she was given…I would suggest she avoid seeking services at that facility. They seem to be not doing their jobs, either as professionals or, for that matter, as decent human beings. She might consider filing a complaint with the state agency responsible for licensing the professional(s) involved and maybe with the state agency charged with overseeing the operation of the agency itself. The rather tepid and unhelpful response she received is unacceptable. It is the responsibility of the professionals at that agency to ensure that such racist symbols were not allowed on the premises and it is their job to do any explaining and/or educating necessary. M is perfectly correct that she has no obligation to educate these folks about something that their professional status requires them being cognizant of and informed about. If they are seeking education from M, they should offer to hire her as a consultant and compensate her for her efforts. Mental health professionals and agencies have absolutely no excuse for not being vigorous and unrelenting in their efforts to ensure an atmosphere of safety and welcome for all who seek services from them. Dr Harper’s observation that healing and trauma centers might not be trained to handle such situations may well be accurate…but…such a lack of training is a deficiency and is negligent according to their own ethical principles and responsibilities. Ignorance and/or absence of competency is no excuse rather it is evidence of failure to adhere to fairly well known and articulated principles of practice. I am sorrowful and sad that M was so poorly served in this situation. Good article! The intent vs impact distinction is a nice concise way to explain why many things are offensive which aren’t considered so by privileged groups, will definitely be using it.